This slide show includes photos from the Jefferson Lab Open House held in May 2012. Between 7,000 and 8,000 visitors attended. They were able to see many of the unique research facilities and learn about the leading-edge projects underway at the lab, as well as participate in a variety of science education activities and catch the ever-popular Liquid Nitrogen Demonstration. Jefferson Lab will host a public open house on Saturday, May 17. It is the once every-other-year opportunity to spend the day exploring this world-class research facility. A number of the lab's facilities will be open and visitors will be able to see, hear about and experience some of the research effort underway at the lab. Attendees will be able to visit the upgraded CEBAF accelerator and the lab's newest experimental hall - Hall D - where state-of-the-art particle detectors are being installed. The accelerator upgrade and the new experimental area are a cornerstone of the lab's 12 GeV Upgrade project. The $338 million project, funded by the U.S. Department of Energy's Office of Science and scheduled for completion by Sept. 30, 2017, will allow the lab to continue as a world leader in nuclear physics research. The project is providing new and enhanced research capabilities for the 1,250 scientists, from more than 250 institutions, who come to Jefferson Lab to carry out experiments. The theme for this year’s open house is “Accelerating Discovery” in anticipation of bringing the upgraded CEBAF online. Many of the lab's research and work areas will be accessible or on display for the event. Exhibits, demonstrations, tours and hands-on activities will be available, providing a day of education and fun for people of all ages. Visitors will be able to talk to and learn first-hand from staff and visiting scientists about the range of research underway at the lab, as well as its particle-acceleration capability (superconducting radiofrequency), a technology for which there is growing interest in the U.S. and abroad. The lab's supercomputing and simulation capabilities will be on display, and research labs in the Free-Electron Laser Facility will be open. The event strives to be family friendly and will feature a variety of hands-on, science-education activities for the young and young-at-heart. A number of local universities, museums and government agencies will present activities and information on complementary scientific endeavors. The open house will be free of charge and will be held rain or shine. Parking will be free. Visitors will be able to arrive from 9 a.m. - 2 p.m. and stay until 3 p.m.
More about the event, including directions to public parking, is posted on the event website at: https://www.jlab.org/openhouse. The webpage will be updated as additional information becomes available. Hundreds of lab employees, visiting scientists and students will be needed to help out the day of the event to staff displays, guide visitors around facilities, give demonstrations, answer questions, greet and direct visitors and help with crowd flow. Volunteer signup will begin in early April. 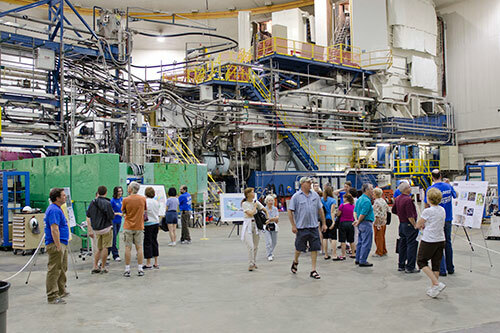 Jefferson Lab's last Open House was in May 2012. Pictured is one of the two linear accelerators (linacs) in CEBAF. After years of effort and preparation by work groups across Jefferson Lab, on Feb. 5, accelerator operators sent electrons around the accelerator once and achieved full upgrade-energy acceleration of 2.2 GeV in one pass. Then they ran the accelerator at this specification for the next eight hours, achieving 50 percent availability on their first run of the machine at design spec. If there is one theme to describe the monumental effort that led to the first successful operation of the newly upgraded Continuous Electron Beam Accelerator Facility accelerator, it is that it takes a community to build such a machine. And on Feb. 5, accelerator operators helped bring that community effort one step closer to fruition when they achieved a critical step in bringing Jefferson Lab's main machine, the CEBAF accelerator, back online following its first major upgrade. After years of effort and preparation by work groups across the Jefferson Lab complex, accelerator operators sent streams of electrons around the accelerator once and achieved full upgrade-energy acceleration of 2.2 GeV in one pass. Then they ran the accelerator at this specification for the next eight hours, achieving 50 percent availability on their first run of the machine at design spec. "What's important here is to reflect upon what we accomplished as a group, as a laboratory, in getting this done. It's not so much about how wonderful the hardware is working, but about how wonderfully we work together," said Arne Freyberger, Accelerator Operations manager. CEBAF is a superconducting accelerator that had been operating at 6 GeV, or 6 billion electron volts. In 2009, construction work began for doubling the energy of the accelerator to 12 GeV as part of the 12 GeV CEBAF Upgrade project. The 12 GeV Upgrade is a $338 million project that, in addition to doubling the maximum energy of the electron beams in Jefferson Lab's accelerator, also includes the construction of a fourth experimental hall, and upgrades to equipment in existing halls. The full project will be complete by Sept. 30, 2017. "It is something to build upon. We had a review not by a panel of experts, but by Mr. Maxwell and the laws of physics. And I think we passed," Freyberger added. "We've demonstrated that the core technology of the accelerator works," said Leigh Harwood, 12 GeV Upgrade project lead for Accelerator. "The core technology is in the linacs. We've demonstrated that the linacs provide the acceleration for eventually reaching 12 GeV. We have also demonstrated that the magnet designs and diagnostics work as planned." CEBAF is a racetrack-shaped machine that is composed of two linear accelerators, also called linacs, connected by two arcs of magnets. Each linear accelerator now contains 25 cryomodules, the modular devices used to accelerate electrons. Of those, 20 were in the original CEBAF and five are new cryomodules that were added to upgrade the machine, along with additional support components. In this demonstration, the electron beam originated in the injector and was then sent through the first linear accelerator, around an arc, through the second linear accelerator and second arc, and finally into a beam dump at the end of the second arc. The superconducting radiofrequency technology that powers the accelerator also required an addition to the accelerator's refrigeration plant, the Central Helium Liquefier, to double its capacity. Other tasks included an upgrade of the magnets and the associated power supplies that steer and focus the beam and other new and upgraded beamline components to a new experimental area, Hall D.
The 12 GeV electrons will be delivered to the tagger area, where they will generate the photon beam for Hall D. Electron beams with energies up to 11 GeV will be delivered to the three experimental areas used during the 6 GeV research era, Halls A, B and C. Upgraded and new equipment is being installed in those halls to expand the research capabilities available to scientists. "Achieving this goal is not the end of the story; in many ways, it is only the beginning," said Hugh Montgomery, Jefferson Lab director. The next step is commissioning the Hall A experimental apparatus with 3-pass beam of greater than 6 GeV. Delivering this beam energy will be the first demonstration of beam beyond the original accelerator's operational energy and will herald the first beams for experiments in the 12 GeV era. Heavy equipment is being used to prepare the land at the intersection of Oyster Point Road and Jefferson Avenue for construction of the Tech Center at Oyster Point. Big changes are coming to the lot next door. The large triangle of land bordered by Hogan Drive, Jefferson Avenue and Oyster Point Road will soon be developed into a mixed-use neighborhood, complete with retail shopping, restaurants, a residential area and commercial space. According to a website devoted to the new development, the theme for the Tech Center at Oyster Point According to the developer, W.M. Jordan, the center will feature more than 250 apartment homes, 50,000 square feet of specialty office space and 260,000 square feet of retail shops and restaurants. The first of the center's retail spaces is slated to open in the summer of 2015, including a 35,000 square-foot Whole Foods Market, which will be the second Whole Foods in Hampton Roads and the first store scheduled to open. The shopping area will also feature open-air seating, media centers and whiteboards to foster collaboration and discussion, and a grassy space for a farmer's market, concerts and other entertainment. In addition, wide sidewalks, such as the new sidewalk now in construction along Jefferson Avenue near Thimble Shoals, is planned to be continued along Jefferson Avenue to the Tech Center. While there has been a lot of focus on the Phase I aspect of the center, the shops and restaurants, work will also soon begin on Phase II. This phase features three- and four-story luxury apartment buildings (fall 2014), while Phase III includes the first portion of a research park to be managed by Virginia Tech, with buildings to house commercial and office spaces. These phases will also include the development of paths for walking, hiking and biking through the center. All of these amenities won't appear overnight. The developers are just beginning to prep the site for construction. Currently, W.M. Jordan crews are clearing trees and prepping two areas, along Hogan and Oyster Point Road, for sediment basins. As construction ramps up, Jefferson Lab employees, users and visitors can expect additional construction traffic around the site; this will include heavy equipment. However, the developers plan to mitigate any impacts to its neighbors, including Jefferson Lab. For instance, the developers say that the new design for traffic control will help to prevent traffic back-ups along Oyster Point and Jefferson during rush hour. In the next 16 months, they will extend Jefferson Avenue's right-turn lane for the intersection at Oyster Point. They will also add a new right-turn lane on Oyster Point just past the Jefferson Avenue intersection for access to the Tech Center. A traffic study has been conducted for the intersection of Jefferson Avenue and Oyster Point. Using data from the study, the developers will have the traffic light timed to ease congestion at the busy intersection. But perhaps the biggest change will be seen at Jefferson Lab's Hogan Drive entrance. Hogan Drive will feature as an important entrance into the Tech Center. To prevent traffic tie-ups on Hogan, W.M. Jordan plans to widen the two-lane road to four-lanes, which will initially extend just past the first entrance into the Tech Center. Later in the development, plans call for the four-lane to continue past the Rattley Road entrance onto lab property. The Hogan widening will have a major impact at the intersection of Hogan Road and Jefferson Avenue. Commuters will have three lanes on Hogan to choose from to access Jefferson Avenue: a left-turn lane, a combination left-turn and straight-through lane and a right-turn lane. The big changes will require roadwork on Hogan, Jefferson and Oyster Point. The bulk of the work on Hogan is anticipated to occur this summer. W.M. Jordan intends to leverage the school's summer vacation period to minimize impact on the many buses that travel Hogan Road to the Newport News City Schools depot (S.C.O.T. Center). The work will require shutting down one-half of Hogan Drive at a time. Traffic will be re-directed to the open side of Hogan during construction. Work is slated to begin in June. Another major traffic change will occur on Lawrence Drive. The portion of Lawrence that extends from the Applied Research Center parking lot entrance to Hogan Drive will be converted to a permanent one-way road. This portion of Lawrence Drive will become entrance only; no exit will be allowed from Lawrence onto Hogan. Additionally, this portion of Lawrence will be closed for a few weeks in late May for the installation of a sewer pipe for the Tech Center development. The closure dates will be announced as soon as the work has been scheduled. Jeffrey Johnson, recently hired by the Virginia Tech Corporate Research Center to oversee and manage the research park, says interest is already picking up. With plans to open the first of the park's buildings in 2015, the goal is to leverage ideas that come out of the many local technology centers, including Jefferson Lab. Meanwhile, expect the activity next door to ramp up in the coming months. Jefferson Lab's Public Affairs and Facilities Management & Logistics staff are in contact with the developers and will provide information on future impacts to the lab as the work progresses. John Arrington, group leader of the Medium Energy Physics Group at Argonne National Lab and a long-time member of the Jefferson Lab community, is chair of Jefferson Lab’s Users Group Board of Directors. With a membership of more than 1,250 researchers, the Users Group exchanges information between users and lab staff, and it also offers advice to lab management on matters of policy affecting the development and use of lab facilities. John Arrington, the new chair of Jefferson Lab’s Users Group Board of Directors (UGBOD), has been a part of the lab community since 1993. At that time, he worked for three years in Hall C as a Caltech Ph.D. candidate. With the completion of his thesis, titled “Inclusive electron scattering from nuclei at x>1 and high Q^2” in 1998, he received a postdoctoral position at Argonne National Laboratory. He has been a staff physicist in the Medium Energy Physics Group since 2001 and was recently named group leader. Over the years, this Madison, Wis., native has received numerous awards, including a National Science Foundation Graduate Research Fellowship, the DNP Dissertation Award in Nuclear Physics, the Presidential Early Career Award for Science and Engineering, and he was named a Fellow of the American Physical Society in 2012. While the majority of Arrington’s research work at Jefferson Lab has been in Hall C and Hall A, he’s also been very involved in a variety of lab committees and collaborations; he served on the steering committees for Halls A and C, the 12 GeV Steering Committee, the electron ion collider nuclear QCD working group, and the Users Group Board of Directors. Now, as UGBOD chair, he has a particular interest in improving communication between the users and the lab. “As we enter a period of change and transition, the Users Group has a big role to play to bring together members from the whole organization,” he said. With a membership of more than 1,250 researchers - from 40 countries and representing more than 200 institutions – the Users Group has acted as a resource to encourage and assist scientists since its beginnings in 1984. It serves as a channel for the exchange of information between users and lab staff; offers advice and counsel to lab management on matters of policy affecting the development and use of lab facilities; supports, encourages and assists in the advancement of basic scientific knowledge; and promotes the most effective use of the lab's assets for the common good. There are five at-large members on the Board of Directors, each with a focus on a particular sphere of interest: Quality of Life, Computing, Running Experiments and the Program Advisory Committee, Outreach, and Foreign Visitors. Three other members are devoted to specific constituencies: theory, postdocs and graduate students. These board members each serve a two-year term and half of the positions come up for election every year. The chair serves a total of four years – one as chair-elect, two as active chair, and one as past chair. The board has formal meetings with lab management and sends out results and highlights of those meetings to Users Group members. But, Arrington said, he hopes that during his tenure, a more on-going and casual communication and collaboration will take place. In addition to the annual meeting, the UG also holds two smaller gatherings each year, at the American Physical Society (APS) April meeting and the fall Division of Nuclear Physics (DNP) meeting in order to reach people who wouldn't necessarily come to Jefferson Lab. The group gathers twice a year with lab management and advises the JSA Programs Committee on the relative merits of user-generated proposals for annual program funds. It also selects winners for the annual postdoc and thesis prizes. Many of the Users Group's programs and efforts are funded by the JSA Initiatives Fund Program, including the poster competition, thesis prizes, postdoc research grant, support for the annual Users Group meeting and for the DNP meetings, as well as travel assistance for junior scientists to scientific conferences, etc. A recent experiment carried out at Jefferson Lab to study a rare instance of symmetry breaking in electron-quark scattering has provided a new determination of an intrinsic property of quarks that's five times more precise than the previous measurement. The result has also set new limits, in a way complementary to high-energy colliders such as the Large Hadron Collider at CERN, for the energies that researchers would need to access physics beyond the Standard Model. The Standard Model is a well-tested theory that, excluding gravity, describes the subatomic particles and their interactions, and physicists believe that peering beyond the Standard Model may help resolve many unanswered questions about the origins and underlying framework of our universe. The result was published in the Feb. 6 edition of Nature. The last experiment to access this coupling combination was E122 at the Department of Energy's Stanford Linear Accelerator Center (now SLAC National Accelerator Laboratory). Data from that experiment were used to establish the newly theorized Standard Model more than 30 years ago. The good agreement between the new 2C2u - C2d result and the Standard Model also indicates that experimenters must reach higher energy limits in order to potentially find new interactions beyond the Standard Model with respect to the violation of mirror symmetry due to the spin of the quarks. The new limits, 5.8 TeV and 4.6 TeV, are within reach of the Large Hadron Collider at CERN, but the spin feature provided by this experiment cannot be identified cleanly in collider experiments. The experiment was funded by the DOE Office of Science, the National Science Foundation Division of Physics and the Jeffress Memorial Trust, as well as with support provided to individual researchers by their home institutions. Nearly 100 researchers from more than 30 institutions collaborated on the experiment, including two DOE National Labs, Jefferson Lab and Argonne National Lab. Editor’s note: This article was first published on Jefferson Lab’s website on Feb. 5. Jim Follkie, chair of Jefferson Lab’s Workers Safety Committee (WSC), has a message he wants to share with every member of the lab community: we’re here to help. Since 2001, the 10-member committee has met monthly to take up safety concerns from workers across the lab. But, despite its decade of involvement and improvements, many members of the lab community don’t fully understand the role it plays. The WSC serves as a vital communication link for highlighting workforce safety issues and concerns and as an additional way for those concerns to be addressed, according to Follkie. Everyone at the lab is empowered on a routine basis to deal with safety issues at any time, in any situation, and they know that they can take any type of safety concern or question to their supervisor, safety warden, division safety officer, ESH&Q, a Subcontracting Officer's Technical Representative (SOTR), or to any of the committees in place to handle topic-specific problems and questions. The WSC exists specifically to address safety issues that, for one reason or another, have not been mitigated, or which have come directly to the attention of its members. Each member of the WSC is a volunteer who has taken on the commitment and responsibilities of being on the committee, in addition to their regular work duties. They are all non-management employees and represent every major division in the lab. Committee members are selected by their peers for a two-year term. Terms are staggered intentionally so that the group's collective knowledge isn't lost and flows naturally from year to year. Fixed, rotating terms also provide a way for members to take the enhanced safety mindedness they gain while on the WSC back to their divisions and to the lab community at large. As WSC chair, Follkie sits on the Director's Safety Council, which meets quarterly. And senior lab management, including Director Hugh Montgomery, is invited to the second half of every WSC meeting. Tina Johnson, ESH&Q staff administrator and the lab’s ESH&Q Reporting Officer, is a non-voting member of the WSC who serves as recorder for the committee. She maintains records of the WSC meetings and brings critical information to the committee when there have been safety incidents or reportable near-misses. While many safety issues that concerned construction and traffic flow have abated, new issues have replaced them. For instance, many workers are in new and not-yet-familiar surroundings and need to be mindful of moving differently in their new space. “Our message is, ‘Slow down and focus on what you’re doing,’” Follkie noted. Since June 2013, when Follkie became chairman, numerous safety challenges have been brought forward and addressed by the committee, among them: an 8-foot section of concrete was replaced after a person rolled their ankle; a trip hazard in a high-foot-traffic area was repaired; stop lines on the roads were repainted; and windows were installed in solid doors and some badge readers were moved to eliminate the chance of someone bumping their head on a door when bending over to get their badge read. Each member's role on the WSC goes far beyond monthly meetings. They are available by phone or email at any time for anyone at the lab with a safety concern that's not been satisfactorily resolved. According to Follkie, reporting minor incidents and near misses helps make us aware of new safety concerns and allows the lab to apply lessons learned before something small causes a bigger problem or an accident. And that, in the end, is what the Workers Safety Committee is about. Jefferson Lab’s high school and college undergraduate summer interns develop posters explaining the project or research they worked on over the summer. The students get to discuss their work with the lab community during a poster session held on the last day of the summer programs. Summer will be here soon; and Jefferson Lab’s Science Education team is planning and preparing for the lab's 2014 summer science internship programs. The internship programs conducted each summer are designed for high school students and college undergraduates interested in finding out about or pursuing careers in STEM fields (science, technology, engineering and math). Six outstanding high school students have been selected to participate in the lab's High School Summer Honors Program, which will be held June 23 through Aug. 1. Critical to the success of their internship experience are projects for the students and mentors who can oversee one or more students as they carry out their work. These students have a strong academic record and are excited to have the opportunity to dive in and learn about the lab's science and technology, according to Brita Hampton, high school internship programs manager. The students are currently in the 11th and 12th grades and have expressed interest in pursuing scientific and technical careers. “Mentorship is a critical part of the learning experience for these high school students,” Hampton notes. Lab scientists, engineers and other technical managers who are interested in serving as a mentor to high-achieving high school students and have a project, or any number of small projects that can be accomplished over the summer, are asked to send to Hampton a description of the work to be assigned. Email Hampton@jlab.org or call her at ext. 7633 if you have questions. She needs ideas or proposals by May 1. The students will be required to develop a poster about their project and present it during a poster session on the last day of the program. Lisa Surles-Law, undergrad internship programs manager, oversees the SULI and REU interns. Both programs serve students who are majoring in physics, science, engineering, computer science, and mathematics. The programs start together at Jefferson Lab and run for 10 intense weeks; the 2014 programs will run from May 27 to Aug. 1. The Science Undergraduate Laboratory Internships (SULI) program is designed to provide undergraduates with valuable educational experiences that allow them to participate in mission-related research at Department of Energy facilities. The program is supported by the DOE's Office of Science, Office of Workforce Development for Teachers and Scientists. The Research Experience for Undergraduates (REU) program conducted at the lab is a partnership between Old Dominion University and Jefferson Lab, and is funded by a National Science Foundation grant. The REU program offers students direct access to laboratory equipment, facilities and staff through research experiences that aren't generally available on college campuses. Both give participants valuable educational, interpersonal and job-skills experiences by doing "real time" work in a laboratory setting, according to Surles-Law. Feedback from the interns has been very positive over the years, according to Surles-Law. "Nearly everyone has responded that the internship experience was very meaningful. We really enjoy seeing the students' progress over the course of the program. Many of them make noticeable advancements – academically, professionally and on an interpersonal level. It is thrilling to see a student go into a new environment and start absorbing it. They start to understand how they can produce something of value and how their efforts can make an impact," she continues. "They learn to handle responsibility and take their commitments very seriously." In 2012, a "Roads to Success" discussion between the students and a panel of lab staff was added to the agenda. The panel included a senior lab manager, a former intern, and representatives from a couple of the major divisions. Panel members shared their professional and personal experiences, and provided perspective and insight on their respective fields and career challenges. The interns are required to develop a poster based on the work or research they conduct over the summer. "The interns must develop their posters and prepare so they can present and discuss their research and answer questions. They are expected to dress and present themselves professionally," she explains. "It is a rare opportunity for the students to do this – especially within a scientific community. The poster session is well worth the time and effort; it provides the students with a great experience and good material for a first CV (curriculum vitae). And, it gives them a finished product (the poster) that can be used for other events later in the academic year." The REU students also make oral presentations of their research projects to the faculty and students of the Physics Department at Old Dominion University. The SULI program is available to undergraduates at 15 of the DOE national labs. Jefferson Lab conducts its program over the summer, but many of the larger labs also offer spring and fall sessions. Students may participate in two SULI internships – both can be at the same lab or at different labs. Jefferson Lab Staff Scientist Patricia Solvignon accepted a “bridge position” at the University of New Hampshire in 2013. The newly created assistant professorship was jointly created by the lab and UNH. For Jefferson Lab Hall C Staff Scientist Patricia Solvignon and her young family, five years of separation have come to an end. In the fall, Solvignon was named as an assistant professor at the University of New Hampshire, where her husband, Karl Slifer, a long-time researcher at Jefferson Lab, has a position. The couple’s two-year-old daughter, Anna, is finally getting to see both her parents, every day. Solvignon grew up in a French village of just 800 people where everyone knew everyone else and generations of families stayed close. Solvignon recalls visiting with her grandparents after school each day, playing with dolls and loving every minute of school. Her mom worked in a neighborhood restaurant and so was readily available if her daughter needed her. She was always self-driven. She and her brother jumped right on their homework; no one had to tell them to study. And, for Solvignon, the extreme harshness of an elementary school teacher spurred her to even greater academic, emotional and independent heights. It was late in her schooling, she noted, before a professor (Jean-Claude Montret, LPC Clermont-Ferrand) praised her skills and encouraged her. “He told me, ‘You are made to do research,’” she recalled. “I was very surprised.” But pleased. Professors recommended that she come to the United States to do her Ph.D., but there was a problem: she was struggling with the level of English proficiency required by graduate schools. Physics is a small world, and there are, at times, solutions that are not immediately apparent. A researcher at Blaise Pascal, Pierre Bertin, talked to his friend Zein-Eddine Meziani at Temple University. “Zein-Eddine said, ‘You come here – take English classes – and then start your Ph.D. It will work out,’” Solvignon said. So she set out with two huge green suitcases and barely a smattering of English for Philadelphia, Pa. When she signed up for English classes at Temple, they told her it would take two semesters for her to become fluent. “I told them, ‘No! I don’t have that much time,’” she recalled with a laugh. In her typical, can-do fashion, Solvignon bought a television and watched episode after episode of “Friends” and “Seinfeld.” And that’s one of the ways she improved her English in less than a semester. Solvignon first came to Jefferson Lab to work on her thesis experiment in 2001. Although the culture shock of moving from Philadelphia to Newport News was significant, it was tempered by the fact that Slifer, whom she’d met at Temple, was already doing his own work at the lab. Her thesis, titled “Measurement of the 3He Spin Structure Functions in the Resonance Region: A Test of Quark-Hadron Duality in the Neutron,” was completed in 2006 with Meziani as her advisor, and she received a three-year post-doc position with Argonne National Laboratory under the supervision of John Arrington. One of those years was spent living in Chicago; the other two at Jefferson Lab working in Hall A. By 2009, she had become a staff scientist in Hall C and an affiliate professor with the University of New Hampshire, a role that allowed her to advise students but carried no salary from the university. The newly created assistant professor “bridge position” she now holds was jointly created by the lab and UNH and has given her the best of both worlds. “I am able to do my research at the lab and have a real teaching job at the university,” she said. Solvignon has an experiment that is scheduled to run in the upgraded CEBAF in 2015/16; it will investigate the isospin dependence of 2N- and 3N-SRC through the 3H/3H cross section ratio. She is also an active member of the lab’s Tritium Target Task Force that is working on a detailed design for the implementation of a safe, low-density tritium target. She is particularly excited about this work because it is the first time such a tritium study will done at the lab. Currently, she’s at the lab for about a week each month. Beginning this semester, she is teaching three days a week at UNH. By the time her experiment will run, she’ll be able to switch her schedule around to accommodate the work. Looking back over the years – including nine moves within the U.S. – Solvignon finds great joy in the evolution of her life. Christian Whalen was named Jefferson Lab’s new Property manager in December. He started working at the lab in May 2013 as a temporary contract employee. Born in Minnesota but raised between California and Florida for most of his youth, Christian Whalen could hardly have foreseen that his path would lead him to Jefferson Lab as its new Property manager. He grew up being regaled by his great-uncle’s stories of life in the Army during World War II, and in 1987 he decided to follow that path as well. Over the next 20 years, he served in a variety of positions within the Army aviation community, specializing in helicopter maintenance and support. He served at locations across the U.S. and abroad, including stints in Iraq, Bosnia and Germany. He participated in coordinating logistics support for the Hurricane Katrina aftermath – planning, scheduling and executing the operations needed to move hundreds of people and millions of dollars’ worth of equipment to support and maintain humanitarian aid operations. From 1993 to 1996, he was a recruiter in Florida. While serving there, he met the woman who would become his wife. He and Suzanne, who was working for a local police department at the time, were married in 1993. After the Army moved them to Germany, she learned the local dialect so well that she created and taught a class for Army wives on how to shop on the local economy. An assignment as the Support Operations manager for 800 troops deploying from Ft. Hood to Iraq provided him with valuable experience that now serves him well as the lab’s Property manager. He retired in 2007 at the rank of First Sergeant and secured a position as a contractor with Sikorsky Aerospace Maintenance, a division of United Technology Corp., working as site manager for the new Army UH-72 Lakota Helicopter. He was responsible for overseeing the building of a new site from the ground up, including scheduling aircraft for flight operations, and implementing all regulations and new policies and procedures. He received Sikorsky’s President’s Award for Excellence and was recognized for maintaining exceptional site profit margins in a time of shrinking budgets. Unfortunately, those budget cuts hit him personally in September 2012, when he was part of a reduction in force and found himself, for the first time in his life, without a job. Fortunately, Whalen and his wife had decided early on that they would “live lean” on his income alone and were able to weather that period. During that time, he also started working on his Bachelor of Science degree from Embry Riddle Aeronautical University, which he completed in 2012, and is currently halfway through a master’s degree program he started in 2013. In May 2013, he came to the lab on a temporary contract as a technical writer working with Bruce Lenzer, ESH&Q Division, to rewrite programmatic documents and standard operating procedures (SOPs) for the section – in order to realign them with new regulations from the Department of Energy. When that project was winding down, he applied for the Property manager position, which had been vacant since the death of Carl Iannacone. Whalen started work as the lab’s Property manager in December 2013. The Property Management department is tasked with identifying all controlled property, maintaining records and accountability, tracking inventory, ensuring that all sensitive property is assigned to an individual employee (property custodian), disposing of excess and surplus equipment, overseeing the inventory of precious metals, controlling the lending of Jefferson Lab equipment, and providing reports, training and guidance for everyone assigned to track and control property. Although being in a science-based environment is new for Whalen, he’s eased into the culture happily. In his spare time, Whalen takes his son, who’s now 13, to Tae Kwon Do practice three or four times a week and hits the gym while Caedmon has his lessons. They also enjoy kayaking in the tributaries near their home. He recently answered the call for volunteers to help clean the CEBAF accelerator and spent a day in the tunnel. “I looked around and could hardly believe where I was,” he said. Looking back, Whalen marvels at where he’s been, what he’s done and this new pursuit. Jefferson Lab used the March 11 statewide Tornado Drill as an opportunity to test its emergency communications systems and to roll out its new Public Address capability. At 9:45 a.m. the lab tested the Public Address tool built into the Cisco phone system. This was in addition to activating the lab’s Site Wide Alert (SWA) system (email, page and Cisco phone text message capability). The SWA and Public Address systems are used to notify members of the lab community, who may be indoors, of emergency situations such as a tornado sighting or a tornado warning. The lab uses its tornado siren to warn people who are outdoors of a tornado or tornado warning in the area around the lab. This was the first lab-wide test of the Public Address tool, according to Bryan Hess, network manager. Carl Bolitho, networking engineer, did the technical work to make this capability available to the lab. Up to this point, the PA tool had been tested on a very limited scale. “We were ready for a lab-wide test of this system. It was great to have this test and determine that it is ready for use,” said Hess. This capability is now a part of Jefferson Lab’s emergency communications systems and can be used for tornado and tornado warning advisories as well as for critical emergency situations. The PA tool won’t be used during the monthly Tornado Siren Test. However, Emergency Management plans to test and use the PA tool later this year during a Jefferson Lab emergency response exercise. “While it is beneficial to regularly test these communications tools to ensure functionality and to help familiarize members of the lab community with this additional emergency communication tool, we realize this particular tool could be very disruptive, so we will keep testing to a minimum,” Hess noted. Members of the lab community with feedback or observations regarding emergency communications may email their input to Jefferson Lab's Emergency Manager, Tina Menefee, at menefee@jlab.org. These Milestone entries, listed alphabetically, are full-time, term, casual and student actions posted by Human Resources for January and February 2014.